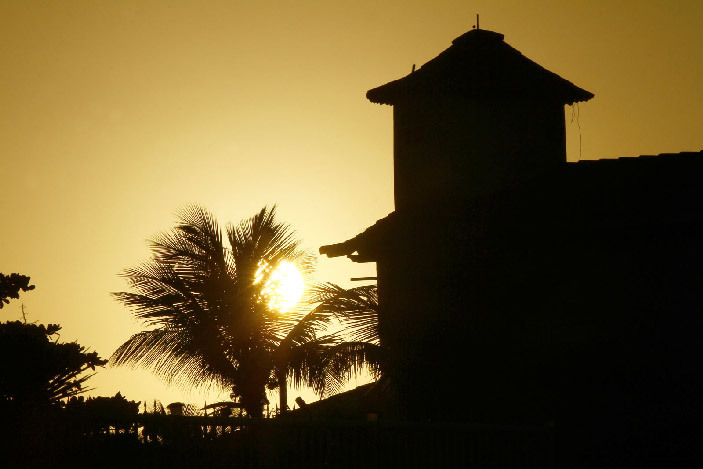 Initial Quarterfinalists decided at QS 10,000 event at Praia de Itauna, Brazil. 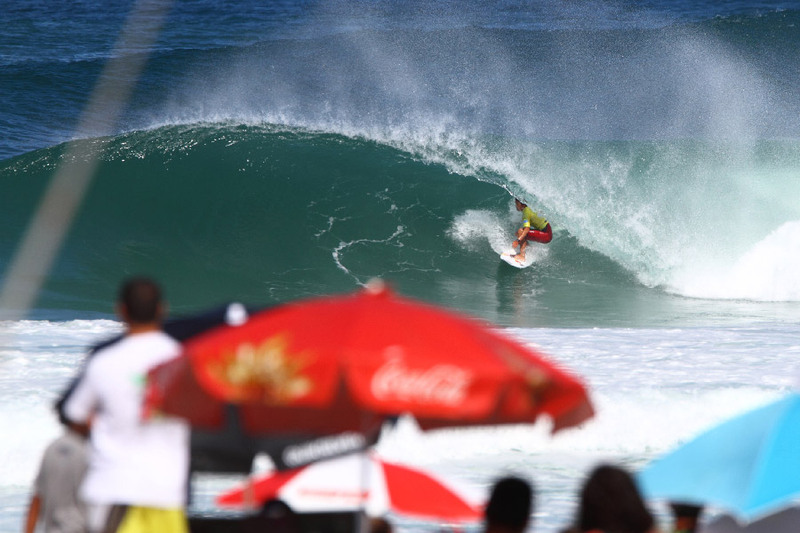 On Saturday, competition continued in pumping surf with waves in the 4-6 foot range (1.5–2 meters) at Praia de Itauna for Day 5 of the 2015 Quiksilver Pro Saquarema presented by Powerade. An overnight build in swell, sunny skies and offshore winds provided a great start to the World Surf League (WSL) Qualifying Series (QS) 10,000 event. Maxime Huscenot (FRA), furnished the day’s highest heat total by scoring an 18.30 (9.23 + 9.07) on his two best waves in Heat 7 of Round 3. In the following heat, fellow Frenchman Jeremy Flores (FRA) scored a 9.83 in Heat 8 of Round 3 for the highest single score at the Quiksilver Pro Saquarema. In the same heat as Flores, Carlos Munoz (CRI) boosted a huge air reverse to earn a 9.50 to advance in 2nd place, eliminating Samsung Galaxy Championship Tour rookie, Matt Banting (AUS). Light offshore winds picked up throughout the day and changed direction, becoming side-shore. But due to the outcrop of rocks on the pointbreak at Praia de Itauna, conditions remained super-consistent as the first four Quarterfinalists were decided at the Quiksilver Pro Saquarema. In the first man-on man heat in Heat 1 of Round 4, Alex Ribeiro (BRA) won a closely fought battle over CT competitor Italo Ferreira (BRA) by a score of 14.83 to 14.77 respectively. With his result today, Ribeiro leaped to 15th place on the WSL QS rankings up from 57th. Only the Top-10 ranked surfers at the end of the year will qualify for the 2016 Championship Tour. In Heat 2 of Round 4, veteran surfer Nathan Yeomans (USA) displayed textbook surfing and solid rail-work to advance into the next round in another close battle over Granger Larsen (HAW), 13.94 to 12.73. “I was having a ball but some good scores were getting out from under me,” stated Yeomans. “I just figured I’d keep riding waves cause there’s that wonk from the backwash. I think ultimately Granger (Larsen) sat too far inside. He needed a six, but I think he was just out of position. I’m stoked because sometimes things don’t go your way, but this time it did. There are some variables. The sun’s right in your eyes and you can feel the backwash, so I’m gonna go back home, do some squats, widen my stance and maybe I’ll come out of some of those,” Yeomans jokingly said. Growing up at the renowned lefthand pointbreak in Pavones, the young Costa Rican surfer, Noe Mar McGonagle, has displayed his powerful backhand surfing throughout the event on the waves at Itauna. In Heat 3 of Round 4, McGonagle ripped a wave apart and impressed the judges enough to earn a 9.43 on his best wave over Joan Duru (FRA) in the closest match-up so far at the 2015 Quiksilver Pro Saquarema, 14.10 to 14.07. In the last heat of the day, Cooper Chapman (AUS) was able to overcome Conner O’Leary (AUS) by a score of 12.00 to 10.66 in Heat 4 of Round 3.